My Name is Florian Schwarz, I am 28 years old and I live in Germany. My greatest passion is to travel, see the world and meet interesting people. My name is Arzu Tokgöz. I am 26 years old and from Germany. I love reading books and discovering new cultures. Therefore, I am interested in getting to know people from all over the world. My name is Sarah Ritschel. I am 27 years old and from Germany. I love travelling and meeting a lot of interesting people. I am interested in arts, literature, theatre and fashion. We are trainee teachers at vocational colleges in Germany and are attending the teacher training program at the moment. Our subjects are Business Administration (Arzu and Florian), Hairdressing (Sarah), English (Arzu and Sarah), and Politics (Florian). 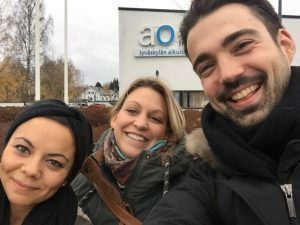 We came to Jyväskylä to get to know the Finnish vocational school system. Therefore, we visited different classes in Business Administration, Hairdressing, English, and Politics and had the possibility to talk to students and teachers about their own educational system. We also presented the German vocational education system to the students and teachers who were really interested and also surprised about some basic differences. Based on these exchanges, we figured out the distinctions between the Finnish and German vocational school system and gained new experiences in teaching. We have been in Finland for three weeks. We arrived in Jyväskylä at the 23rd of October and we will be leaving at the 10th of November. On our way to Finland, we travelled through Tallinn and St. Petersburg. We also want to stay two and a half days in Helsinki from the 10th – 12th of November. We have also visited Rovaniemi, a town in the north of Finland to discover the country. The time of three weeks was perfect for us. Concerning the vocational college that we visited during this time, there we have seen everything and gained many insights into the Finnish school system. As for the city, three weeks were enough to discover Jyväskylä, visit the most important spots and get to know the Finnish culture. We made many experiences during our stay. One of our best decisions was definitely to book the Airbnb flat of Juha Virenius, who is a very nice Finnish ex ice hockey player. He always invited us to his bar and presented us to his friends. So it was possible for us to see how Finnish people live here and pass their leisure time. Therefore, our highlight of the trip was meeting Finnish people here. We have found many new friends and they made our stay unforgettable. They spent time with us in the afternoons after school or in the evenings, cooked for us and were always helpful. We had a very good time with them! Getting to know a lot of teachers at the vocational school was also a pleasure. They were very friendly and invited us to their places. They showed us their way to live and their lifestyle. Having a walk along the lakes: It is very calming and if the sun shines, it gives such a beautiful view. Visiting the tower of Jyväskylä: You will have a great view of Jyväskylä and the lakes around the city. Going to an ice hockey game of JYP: It is a different feeling and atmosphere which everyone should enjoy to understand the Finnish passion for ice hockey. Eating traditional Finnish food and going to sauna: This is highly recommended to everyone visiting Jyväskylä to understand the Finnish culture better. Take definitely sports clothes with you because Finnish people do sports regardless of the weather conditions. They go on a walk on the Harju hill or along the lakes. You should also book an Airbnb flat, so you can cook on your own and have the feeling that you really live in Finland and are not a tourist. Jyväskylä has many museums to visit. Inform you about the museums and try to focus on those you are really interested in. Jyväskylä also has very interesting and authentic coffee shops, inform you about them and try to visit as many as you can.